Ebbsfleet United were left to rue another penalty miss as Alan Julian’s save from Anthony Cook’s spot kick killed off hopes of a revival in Tuesday night’s FA Cup replay. And as if to rub salt in the wound, the only difference on the night was another penalty – this one converted – as Dartford skipper Elliot Bradbrook, celebrating his 200th appearance, kicked his side into the First Round Proper and a date with Salisbury City. Fleet were forced into a reshuffle of their defence, with Shane Huke’s injury meaning Chris Sessegnon started at right back, with Osei Sankofa moving inside to man the centre alongside Paul Lorraine – with Grant Basey fit enough for a place on the bench as defensive cover. The opening exchanges saw Dartford press their home advantage as they came out much more adventurously than at Stonebridge Road, forcing numerous set pieces which seemingly offered their depleted squad the best chance of getting past the Fleet defence. But the visitors had plenty of forays forward too, with Alex Osborn and Billy Bricknell both just short of balls over the top from Cook and McMahon. Ryan Hayes and Bradbrook both forced corners as Preston Edwards was kept on his toes and Fleet struggled for a while to play their possession game as the home side capitalised on some errant passing from the men in red. But McMahon came closest to scoring on 26 minutes when he let fly with a dipping shot that Julian had to tip over the crossbar – and then five minutes later he repeated the trick from a vicious free-kick that clipped the post as it flew behind. Cook’s run inside the box produced another stop from Julian and the Bricknell was inches away from forcing it over the line as the Fleet came into the ascendancy from the half-hour mark. There were vociferous appeals for a penalty, too, when McMahon’s shot seemed to strike a hand in a crowded box, but the referee waved away the protests. But back came Dartford and earned another succession of corners, with Bradbrook heading just over and Lee Burns’ high delivery just eluding Danny Harris in the dying moments of the half, as thoughts turned to Lee Noble’s late goal three days before. But Fleet weathered that storm to enter the dressing room all square at the break. But disaster struck for the Fleet just eight minutes after the restart when Harris broke into the box and slipped a ball through for Noble who was shepherded wide by Sessegnon and Osborn but as he advanced, Osborn barged into him and sent him tumbling. It was something of a soft penalty, but Bradbrook did his duty and duly stepped up to smash it beyond Edwards’ reach to separate the sides once again. Steve Brown sent on Thalassitis for Osborn and the substitute proved to be a good outlet down the right flank for the Fleet, giving Matt Fry a testing time. Dartford began to sit back and play far too deep, with the Fleet having the run of midfield but for all their superiority, Julian wasn’t really tested in the Dartford goal. McMahon saw a rasping shot scrambled wide for a corner and Sessegnon’s low cross almost let Bricknell in before Fleet got what seemed to be a lifeline on 68 minutes. A ricochet sent the ball into the air and Rance powered into the box only to be felled by a high boot to his face from Harris, which sent the Fleet midfielder sprawling. But Cook, ever confident in the build-up about penalties, wasn’t to hold the position of spot-kick king for long as his shot was saved low to his right by Julian and Ben May’s follow-up was blocked as Bradbrook threw himself into harm’s way. Fleet’s last throw of the dice saw Rance make way for Tom Phipp while McMahon and Thalassitis strove manfully to fashion something, anything, that would give Fleet another lifeline. Cook had a good shout for another penalty turned down when he was felled in the box by Fry but the Darts defence held firm. The final few minutes was chaotic, with a flurry of yellow cards for time-wasting, an injury to the linesman that saw him limp off and more than five minutes of added time played. Bricknell was booked for dissent after an inexplicable decision by the referee proved to be one too many for the Fleet striker and his side had one last chance with a free-kick just outside the box, Cook firing it just off target, while even Edwards and Paul Lorraine advanced into the Dartford half. 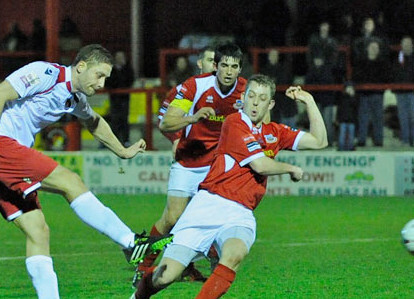 But it was all to no avail and Dartford – as they did last season – had the edge over the Fleet at home. The away fans can only hope they get another chance for revenge next year – and to that end their side now has to concentrate on picking up league points, starting with Concord at home on Saturday. TEAM: Edwards, Sessegnon, Palmer, McMahon, Lorraine, Sankofa, Osborn (Thalassitis 62), Rance (Phipp 73), May, Bricknell, Cook. Subs not used: Hall, Long, Basey, Corcoran.